Jan Hall’s McKenzies Hill property was the ideal setting for our ‘Fence Me In’ session on Sunday June 1, 2014. 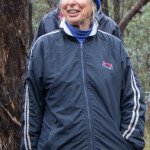 Jan has carried out plenty of planting and also some large and small scale exclusion fencing projects on her 80 acre bush block in an attempt to restore and regenerate, especially the understorey, herbs and grasses. Thanks to Jan for her willingness to show us around and talk about her experiences in conservation work. 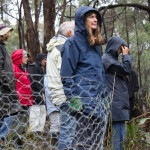 Our presenter Peter Morison (ex-DEPI and Land For Wildlife) has decades of experience in designing and constructing exclusion fences across our region and further north. 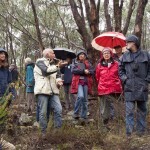 Faced with questions from enthusiastic landholders in the early days of the Land For Wildlife program, Peter organised “boffins on a bus”, with researchers from Arthur Rylah Institute and DEPI onboard, to find out what advice he should be offering landholders, based on current research. 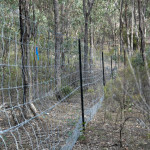 Out of those discussions came the concept of exclusion zones to improve biodiversity. Years down the track, the research and trialling is still ongoing as we learn more about fencing types, browsing behaviour of various animals, and the challenges of managing vegetation within plots. Peter talked about the importance of keeping on top of weeds in exclusion plots. Grassy plots provide their own challenges (especially as native plants have evolved in co-existence with the animals that eat them) and there’s unintended consequences of keeping out some animals (eg. 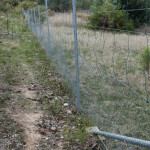 keep out the rabbits and you’ll also stop the echidnas, small mammals and lizards getting in, or moving though, as well). While rabbits are the biggest grazing threat, Jan has found that large mobs of kangaroos can be very destructive to emerging and young eucalypts, as well as the acacias and small shrubs. And if there is no seed bank for plants then excluding grazing animals won’t bring them back – you may have to plant. 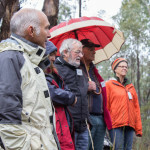 With input from participants, the session covered lots of ground, sharing experiences, tips and techniques on fencing, from individual tree protection, through to 20 acre exclusion zones. Jan also talked about the process of Covenanting. She has a Conservation Covenant on part of her property with Trust For Nature, a legally binding agreement (registered on the Title Certificate) which determines future conditions and rights for the land, with the aim of permanent protection and conservation of private land. Connecting Country’s management committee member Marie Jones summed up the session with the message that we are currently in a great position to be improve local biodiversity, with so many people interested in very practical, achievable ways, to take action on private land, and willing to share their experiences with others. Thanks to Jan and Peter for providing expertise, wisdom and of course, another fabulous venue for the session. Connecting Country held “Fence me in”, the third of a series of six workshops in the Mt Alexander region, on Sunday June 1st. 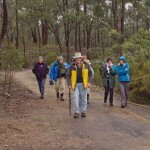 At 9am, 25 keen participants met in Castlemaine and boarded two mini-buses for the short drive McKenzies Hill. 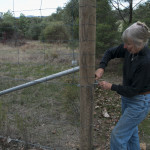 Having purchased the land twelve years ago, Jan Hall is using exclusion fencing in several areas within her 80 acre bush property. Adjacent to State Forest, and with new housing developments nearby, aerial maps helped provide context both at property level and in the broader landscape. 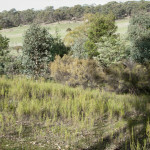 Jan’s aim is to enhance the native vegetation already present and protect plantings from damage by rabbits and a substantial population of eastern grey kangaroos. 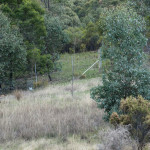 Previously farmland and with a mining history, the vegetation is fairly typical of the Castlemaine area, with regeneration of many closely spaced eucalypts evident. The mid-story is dominated by Drooping Cassinia and wattles, with the developing ground layer including grasses and heavily browsed herbs. 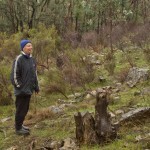 Jan’s two largest exclusion plots were funded by NCCMA’s Box-Gum Grassy Woodland Project and supported by Connecting Country, Castlemaine. 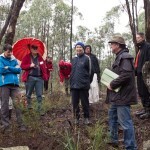 We were guided though the workshop by Peter Morison. 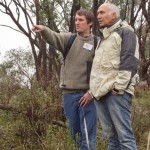 Peter’s 20 years of experience includes work with DSE and Land for Wildlife and he offered many practical ideas and possibilities for using exclusion fencing to restore habitat across a variety of situations. 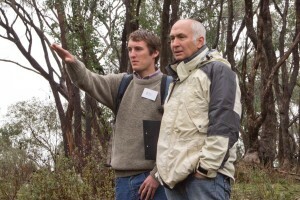 The implications for wildlife such as birds, reptiles and small mammals was discussed, as well as ways of managing the impact of feral animals and weeds. 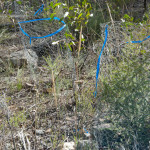 One simple action to reduce the damage to fencing caused by kangaroos is to use sighter tape at intervals along the fence. We viewed several enclosures on Jan’s property, from the large to quite small, either professionally installed or alternatively, very simply, cheaply and speedily home-made. Participants were able to ask questions, discuss solutions and offer some of their own tips and techniques. A strong component of the workshop was learning from each other and generating creative ideas for practical solutions, while being guided and supported by a professional network. 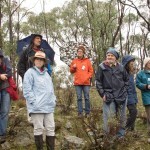 A point emphasised and often overlooked is the support and knowledge that can be offered by Landcare, and participants were encouraged to contact their local group. Information about Trust for Nature Covenants and Land for Wildlife was also given. Jan has found that placing a Covenant on her property has been a great way to provide security for the ongoing nature of the restoration work that she is undertaking. Although a Covenant has a strong focus and structure, Jan found that she was able to negotiate some aspects to suit her own personal situation. Finally, we shared local pumpkin soup and scones provided by C.A.K.E. (Growing Abundance’s catering arm) and participated in an enthusiastic discussion on what we had learned. I look forward with interest to next month’s workshop.